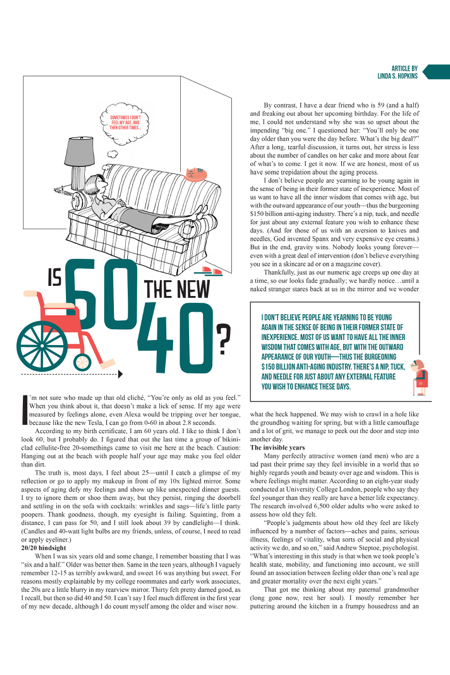 Hilton Head Magazines: CH2/CB2: Is 60 the New 40? I’m not sure who made up that old cliché, “You’re only as old as you feel.” When you think about it, that doesn’t make a lick of sense. If my age were measured by feelings alone, even Alexa would be tripping over her tongue, because like the new Tesla, I can go from 0-60 in about 2.8 seconds. According to my birth certificate, I am 60 years old. I like to think I don’t look 60, but I probably do. I figured that out the last time a group of bikini-clad cellulite-free 20-somethings came to visit me here at the beach. Caution: Hanging out at the beach with people half your age may make you feel older than dirt. When I was six years old and some change, I remember boasting that I was “six and a half.” Older was better then. Same in the teen years, although I vaguely remember 12-15 as terribly awkward, and sweet 16 was anything but sweet. For reasons mostly explainable by my college roommates and early work associates, the 20s are a little blurry in my rearview mirror. Thirty felt pretty darned good, as I recall, but then so did 40 and 50. I can’t say I feel much different in the first year of my new decade, although I do count myself among the older and wiser now. By contrast, I have a dear friend who is 59 (and a half) and freaking out about her upcoming birthday. For the life of me, I could not understand why she was so upset about the impending “big one.” I questioned her: “You’ll only be one day older than you were the day before. What’s the big deal?” After a long, tearful discussion, it turns out, her stress is less about the number of candles on her cake and more about fear of what’s to come. I get it now. If we are honest, most of us have some trepidation about the aging process. I don’t believe people are yearning to be young again in the sense of being in their former state of inexperience. Most of us want to have all the inner wisdom that comes with age, but with the outward appearance of our youth—thus the burgeoning $150 billion anti-aging industry. There’s a nip, tuck, and needle for just about any external feature you wish to enhance these days. (And for those of us with an aversion to knives and needles, God invented Spanx and very expensive eye creams.) But in the end, gravity wins. Nobody looks young forever—even with a great deal of intervention (don’t believe everything you see in a skincare ad or on a magazine cover). Thankfully, just as our numeric age creeps up one day at a time, so our looks fade gradually; we hardly notice…until a naked stranger stares back at us in the mirror and we wonder what the heck happened. We may wish to crawl in a hole like the groundhog waiting for spring, but with a little camouflage and a lot of grit, we manage to peek out the door and step into another day. Many perfectly attractive women (and men) who are a tad past their prime say they feel invisible in a world that so highly regards youth and beauty over age and wisdom. This is where feelings might matter. According to an eight-year study conducted at University College London, people who say they feel younger than they really are have a better life expectancy. The research involved 6,500 older adults who were asked to assess how old they felt. That got me thinking about my paternal grandmother (long gone now, rest her soul). I mostly remember her puttering around the kitchen in a frumpy housedress and an apron. Dull gray hair, tightly curled, her hands thin and veiny, she looked ancient. Yet, doing the math, she was probably all of 50, and old before her time. I’m quite sure she wasn’t turning any heads, but I wonder how she felt? Invisible, perhaps. I also have to wonder what she would have looked like with the advantages of modern hair coloring, skincare products, cosmetics, fitness options, and clothing styles. Nobody tells us this, so we get to discover it as we go: Aging is hard. Many adjustments are required over the years, as we face physical limitations and face up to our changing appearance. What we cannot afford is to get stuck in the gap. We either focus on what is, or get miserably bogged down in the quicksand of what was. The gap between who I am today and who I was 30 years ago is bridged by adaptations that have accompanied my experiences along the way, including adventures, joys and heartbreaks plus a few injuries and surgeries. While certain activities are no longer practical for me (like tennis and high-impact aerobics), I choose to focus on the possible, the achievable, and the enjoyable. If I have painful feet and pancake fanny, so what? I have finally resigned myself to “sensible” shoes and accepted the fact that I will never have a J. Lo booty, no matter how many squats I do at the gym. To obsess about age or deny my years would mean passing up opportunities to be exactly where I am in life, and I would not trade it. So, instead of fretting over a silly date on the calendar, I choose to celebrate each trip around the sun. These days, I don’t think much about my age except when my back is squirreled up, making me feel, oh…about 80, I suppose. Then again, I have 80-year-old friends who astound me with their vim and vigor. Despite a few wrinkles and sags, I’m still the same person I always was, only softer, kinder, humbler, more tolerant, and much more empathetic. I like myself at 60. It may not be the new 40, but it is the new-and-improved version of 60. How old do you feel today? Whatever your magic number is, make every minute count, because tomorrow, if you are still here, you will be a day older and, if you’re lucky, maybe even a tiny bit wiser.